Each month I will describe sights of interest in the night skies of South Carolina. These sights will be broken down into three sections; what you can see with the naked eye, with binoculars, and with a small telescope. 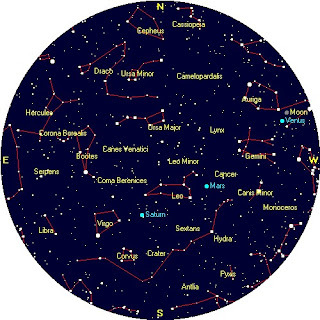 The best time to view the night sky is at and around the times when the Moon is not visible, what is known as a New Moon; which will occur this month on May 13th. For May, your best viewing nights will be from May 1st through May 17th. 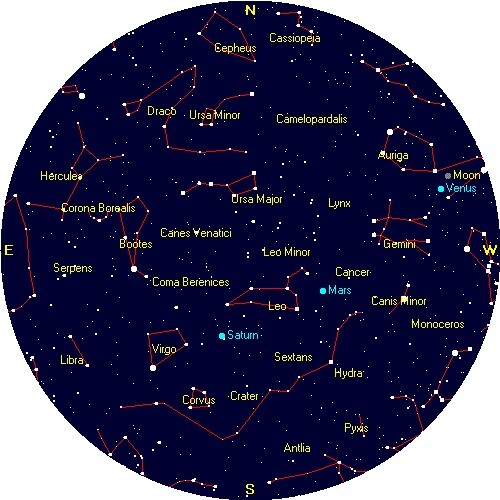 The Star chart below is set for Florence, SC on May 15th at 9 pm. As I have previously mentioned, a good way to begin a hobby in astronomy is to use binoculars. 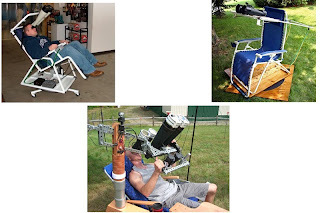 Some of the reasons are: they are light weight, therefore very portable, easy to use, relatively inexpensive, can be used for other things besides astronomy, objects are right side up and not reversed, and you can see a large area of the sky. One downside is their limited useful power. A handheld binocular is only useful at 7-10 power; above that, normal hand shake makes viewing difficult. 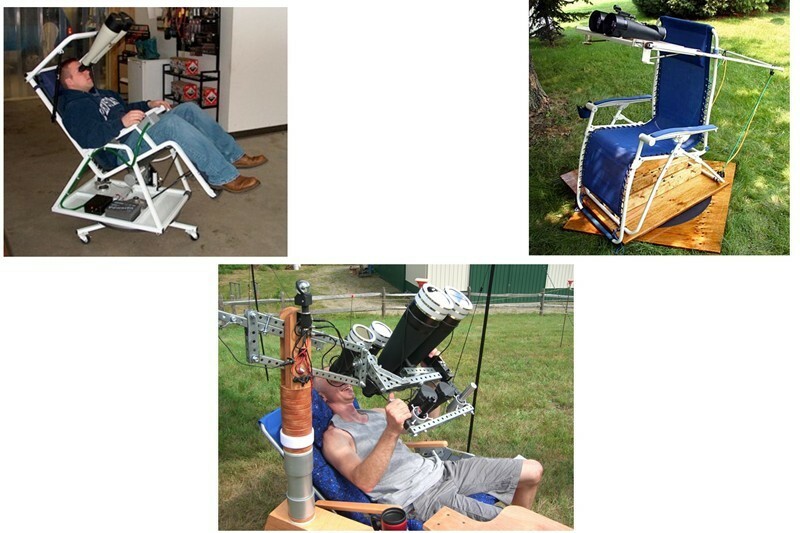 If your interest continues, you will likely purchase a telescope. 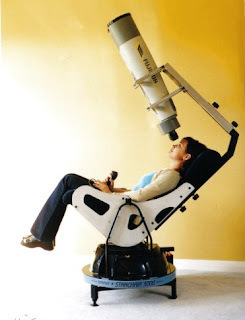 The downsides of telescopes are: they are not light weight, therefore not very portable, not always easy to use, can be expensive, and usually cannot be used for things other than astronomy; also objects may be upside down and/or reversed. 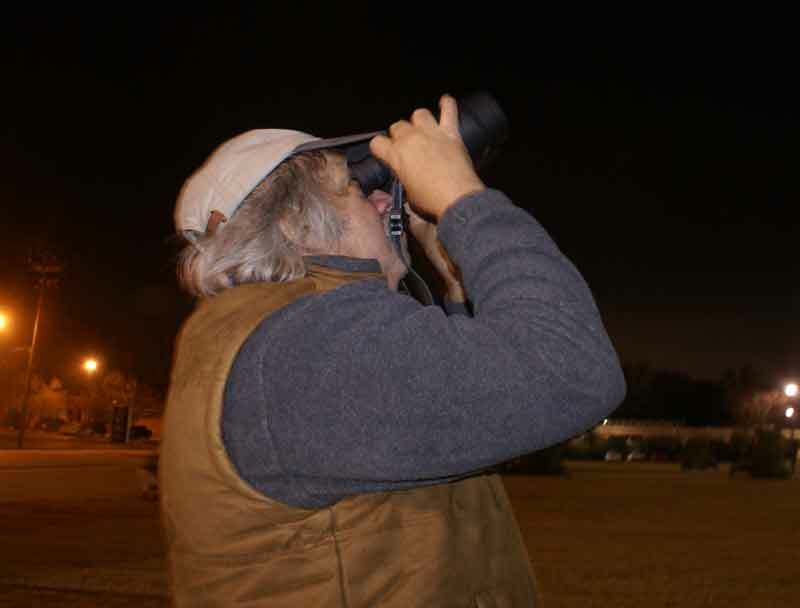 For some reason, in the quest to enjoy the night sky, most amateurs totally neglect choosing “Big Binoculars.” Big binoculars usually range from 15 X 70mm to 40 X 100mm in size, but can be even larger. All the benefits of binoculars are retained, with some limits on portability. The price will also increase as the size increases, and all big binoculars require a tripod. Below is a selection of various binoculars. Moving right to left, the smallest is a 35 mm binocular, followed by two 50 mms, then a 70 mm, and on the far left, 25 X 100mm binoculars. In reality, a binocular is just two refracting telescopes attached side by side. However, there are two main advantages of big binoculars over using a refracting telescope. First, they incorporate prisms, which result in the images being right side up and not reversed. Second, they give better views. 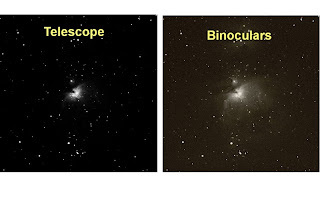 Concerning better views: One cold winter evening several years ago I was out viewing the Orion Nebula, M42, at low power through a Schmidt-Cassegrain reflecting telescope. Out of curiosity, I pointed a pair of binoculars at M42 at similar power. I was shocked! The binoculars allowed me to see much more of the gaseous nebula then the telescope. The images shown below give a good approximation of what I saw that night. 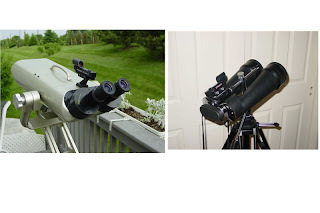 Below are photos of my two big binoculars. Both are 25 X 100mm as shown, however, the binoculars on the left have 45 degree viewing, and interchangeable lenses, and the binocular on the right is straight through viewing, with a fixed 25 power eyepiece. If you decide to venture into big binoculars, on the low price end, 15 X 70mm, 20 X 80mm and 25 X 100mm range in price from about $230 to $350. The only required accessory is a tripod, and these binoculars can easily be placed on a good standard photographer’s tripod. Note my 100mm binocular shown on the right above (weight 10 lbs) is on a simple tripod. The second accessory is not required, but is on my “must have list,” and that is a Red-Dot finder. Again, if you note in the above photos, both binoculars have Red-dot finders attached. Once you start viewing through 25 power binoculars, you will find it somewhat difficult to aim them; sometimes to the point of frustration. These simple little finders will make using big binoculars a joyful experience. 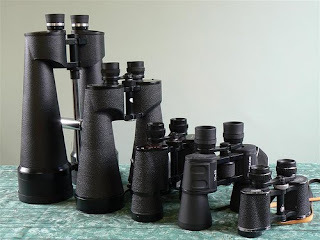 If you have more money available for this hobby, then it would be wise to invest in a 45 degree viewing binocular with interchangeable lenses. However, this will bring the price up to about $1000 to $2000! From my personal experience, the 45 degree viewing aspect is much more important than the ability to increase your power. The reason is that when using a straight through big binocular on a simple tripod, it is almost impossible to view objects above an angle of 50 to 60 degrees; thereby missing a lot of sky. However, I enjoyed using my straight through big binocular for several years. My solution was to just stay up later until the object of choice moved lower and into my range of view, or to look for selected objects at a different month of the year. 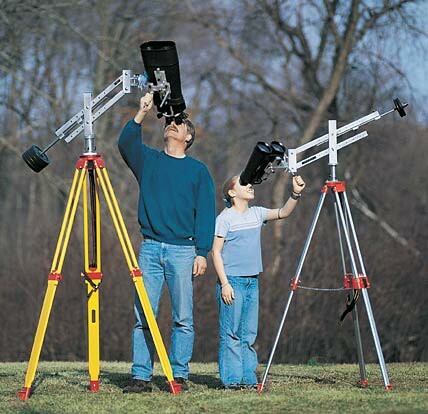 However, there are other options/mounts for the straight view big binoculars besides a simple tripod; see below. If you like to build things, the mount options will increase. And finally, if you recently won the lottery, you will probably opt for the set up below! Enjoy the nice stargazing weather this month. Naked Eye Sights: It is always nice to see Venus near a crescent Moon; this will occur on the evening of May 15th. Telescope Sights (60-100mm): Try looking at Venus; you should be able to observe its phases. If you decide to look at Saturn, unfortunately the ring tilt will be at its worst for the year in May.